Cruise to school/college/work. This obviously isn’t going to work if you have a 5-mile bus journey, but think outside the box – get off a few stops early and skate the rest of the way. Your mello is a handy size to stick in a locker or backpack when you arrive. 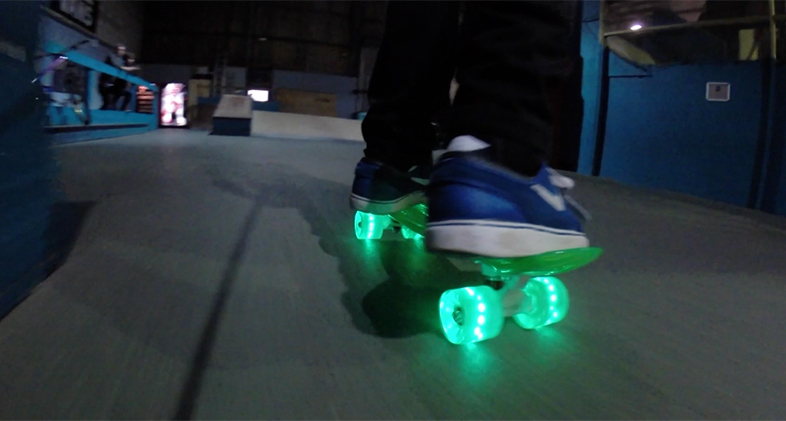 If you normally walk, then skating will get you there quicker, so that’s longer in bed – an all round win. Use of your lunch break – you’ve already got your mello with you, so why not go for a sneaky skate instead of hanging out in the canteen. Remember to leave enough time at the end to eat your lunch though. Evenings in well-lit areas. One word of warning, mello wheel LEDs are fantastic for making sure you are seen but they but are not sufficient for lighting your way on a dark night . Weekends – get the best out of them by pre-planning a cruise route, invite some mello friends and take-off. 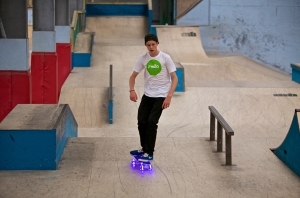 Indoor skate-park – yes you can even skate your mello at the skate park – really! Yep, we know it’s not cruisin’, but when it’s too dark in the evening or raining at the weekend you could discover how versatile your mello really is by giving the bowl and some of the smaller ramps a try. Only if you’re confident your skill level is up to it of course – injuries are definitely not cool. So, with a bit of effort and forethought you can keep cruising through winter. Whadya waiting for? Grab your mello and get out!